EconEdLink - How Expensive are Payday Loans? Students will learn how a payday loan works by watching a video. They will learn that payday loans are an expensive form of borrowing and then calculate the total cost of a payday loan using several methods (table, graph, and formula). Students will learn what makes payday loans an expensive form of quick cash and how to evaluate offers. They will learn the effect rolling over a payday loan can have and also calculate the total cost of the loans and the Annual Percentage Rate (APR). Determine the total cost of a payday loan when given the amount financed, finance charge, and terms of the loan in weeks. Graph the relationship between the number of times a payday loan is renewed and the total cost of the loan. Rearrange the equation for the total cost of a payday loan to determine the finance charge. Which of the following is a characteristic of a payday loan? Rasheem goes to a payday lender and borrows $450. He is told the finance charge will be $50 for two weeks. What is the total cost of his loan if it takes him six weeks to pay it off? Mary Ellen is comparing offers for payday loans from two different companies. She needs to borrow $600. While she knows both payday lenders loan money for two weeks at a time, she doesn’t feel that she will have the money to pay it off in just two weeks. She will pick up extra hours at work to save the money and hopes to pay it off in eight weeks. What would the total cost be at each lender? How much more expensive is the most expensive offer? Show your work. Fast Cash advertises a finance charge of $90 for a $600 loan. Cash Now advertises a finance charge of $18 for every $100 you borrow. Before using the formula, the finance charge also needs to be determined. Since she would borrow $600, the rate of $18 for every $100 borrowed needs to be calculated as (600/100)x18 = 6 x 18 = 108. Using Fast Cash would cost Mary Ellen $1,050 while using Cash Now would cost her $1,140. Cash Now would be $90 more expensive. Wrap up the lesson by revisiting the K-W-L chart created at the beginning of the lesson. Ask students to share what they learned about payday loans from the lesson. Record student responses under the L/Learn portion of the chart. Payday loans are used by consumers to meet short-term needs for cash. A typical two-week payday loan with a $15 per $100 fee equates to an annual percentage rate (APR) of almost 400%. The APR is the percentage of the principal of a loan to be paid as interest in one year and provides a way to compare loans. In this lesson, students will learn that many users of payday loans pay much more than they initially borrowed because of the costs of multiple renewals or rollovers. A rollover occurs when a borrower cannot repay the payday loan in full at the end of the term (usually two weeks) and then must continue the loan or take out a new one. 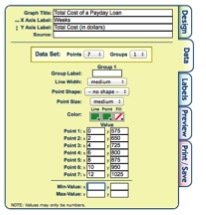 Students will also use formulas to calculate the total cost of the loans and the APR. Tell the students that many people find themselves in these types of situations. Some people in this situation may choose to get cash by going to a payday lender and getting a payday loan. Draw a “K-W-L” (know, want to know, learned) chart on the board such as the one shown below. Ask students what they currently know about payday loans. Write these under the K/Know portion of the chart. Ask students what questions they have about payday loans. Record these responses under the W or Want to Know section of the chart. To elicit further responses, ask students what they think they might learn about payday loans from this lesson. Did the reading give answers to any of the questions you had under the W/Want to Know section? [Answers will vary.] Record these under the L/Learned column. Tell students you are going to show them a video that explains how a typical payday loan works. Instruct them to pay careful attention to the rollovers. Show the video from the Federal Trade Commission available at consumer.ftc.gov/media/video-0078-payday-lending. If playing the video is not possible, read the transcript from Activity 3: Federal Trade Commission Resource Transcripts. The transcript can also be made available to students with oral processing challenges. Tell them that together you are going to come up with several ways to determine the total cost of any payday loan. Ask students to suggest ways you can do this. [Possible answers: make a table or a graph, repeated addition, develop a formula] Depending on student responses, fill in the remaining methods in the answer. Ask students to provide the values for the “Weeks” column (0, 2, 4, 6, 8, 10, 12). Explain that the weeks start at zero because the first fee is paid when the loan is initiated. Since it is renewed or rolled over six times, the values are filled in by skip counting by two for the two weeks in each renewal or rollover. Ask students how much the payday loan cost John when he first signed the paperwork (week zero). [$575 = $500 + $75 fee] Complete the first row of the table as shown below. Remind students that after two weeks, he couldn’t pay back the loan so he paid another $75 fee. Ask how much he had paid in all at this point? [$650] Complete the rest of the table by having students determine the total for each row. Use an interactive graphing tool on a graphing calculator or online to graph the relationship between the weeks and the total paid. One such tool is available from the National Center for Education Statistics at nces.ed.gov/nceskids/createagraph. To obtain a graph such as the one below, follow the directions below for each tab. When facilitating with the class, ask students what changing the values does. 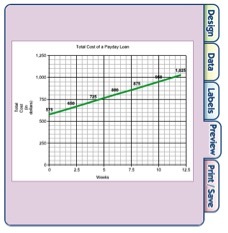 Depending on the level of the students and the technology available, the graph can be completed as part of whole group instruction, in groups, or individually. Choose XY graph from the menu. The end result should appear as the one below. If desired, adjust the appearance of the graph by manipulating various aspects of the graph. In particular, adjust the minimum value of x to 0 and the maximum value of x to be 20 on the data tab. Update the graph and discuss the change. You can see more of the graph; however, the line does not extend. If you were graphing an equation for a line, it would continue. However, this is based solely on a set of data points. Number of rollovers = R (point out the difference between using number of rollovers and number of weeks; i.e., four weeks = two rollovers). Have students check their answer using various numbers of rollovers or “r” values from the example used previously. Remind students that the number of rollovers is the same as the number of weeks divided by two. One such example follows using four weeks or two rollovers. Distribute Activity 2, one copy per student. Have students use the equation to solve the problems. Review student answers using Activity 2 Answer Key. Tell students that the federal government and others caution people against getting themselves into trouble by using expensive forms of credit such as payday loans. Tell them that you are going to play a public service announcement with good advice for consumers from the Federal Trade Commission. Tell them to listen carefully and write down at least one alternative to a payday loan and one thing to consider when weighing one’s options. Play the Federal Trade Commission’s public service announcement (PSA) on payday loans available at consumer.ftc.gov/media/audio-0057-payday-loans. If playing the video is not possible, read the transcript from Activity 3, Federal Trade Commission Resources Transcript or have two students act it out (one male and one female). The transcript can also be made available in advance to students with oral processing challenges. If he had, which of these did he know? Point out that one very important piece of information was missing – the annual percentage rate or APR. Explain that the APR is the percentage cost of credit on an annual basis and the total cost of credit to the consumer, which includes any fees associated with the loan. It is the percentage of the principal of a loan to be paid as interest in one year. Interest is money paid, at a particular rate, for the use of borrowed money. Explain that in the United States the Truth in Lending Act requires all loans – including payday loans – to advertise the APR. The APR provides a way to compare loans. Tell students that there are formulas for calculating the APR. Note: you can leave the x100 off in the equation, but you would need to convert your answer from a decimal (3.9) to a percent (390%). What is the APR on a payday loan in the amount of $600 with a finance charge of $60 per two weeks? Ethan borrows $700 from the payday lender for two weeks. The finance charge is $80. What is the APR? A friend is thinking about taking out a two-week payday loan to pay for a new set of tires that will cost $750. The finance charge will be $90. What is the APR?